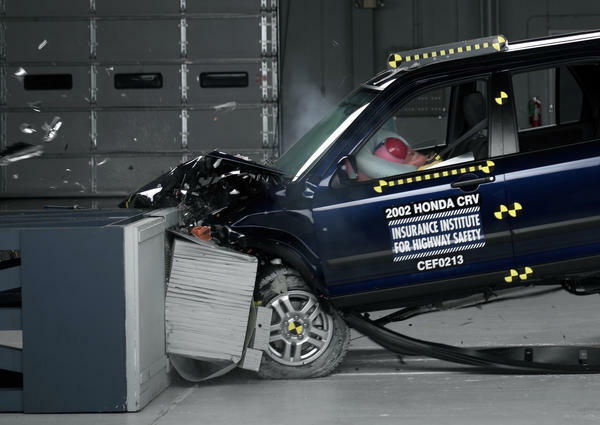 The 2002 Honda CR-V is one of dozens of car models subject to a recall for faulty air bags. The air bag manufacturer, Takata, supplies bags for more than 30 percent of all cars and is one of only three large air bag suppliers. Most auto recalls usually involve one carmaker at a time, but a massive recall this week affects not just one, but 10, ranging from BMWs to Toyotas. At the center of it is Takata, a little-known but extremely important auto parts maker. The company makes more than one-third of the air bags in all cars. Nearly 8 million vehicles have been recalled to have defective air bags fixed, and Congress is now opening an investigation into the problems. Another big issue that sets this recall apart, says Karl Brauer, an analyst with Kelley Blue Book, "is that there's essentially nothing you can do to kind of mitigate the potential damage or danger from these air bags if they fail" — there's no big habit you can change or quick fix you can make. The other thing that makes this different, Brauer says, is the basic fact of what happens when the air bags fail. They're supposed to cushion you during an accident, but instead the defective ones send metal shrapnel flying. "So if you're in an unavoidable or an unpredictable accident, in the blink of an eye an air bag fires, and in that firing, it throws shrapnel at you at a high rate of speed, there's really nothing you can do about it," he says. "One minute you're driving, the next minute, there's an accident — bang, boom! — an air bag pops and there's shrapnel thrown." Takata, a Japanese auto supplier that serves the global auto industry, is responsible for more than 30 percent of car air bags. It's one of only three big air bag suppliers. "If one of those three suddenly needs to recall and replace a whole bunch — like, tens of millions of air bags that they've already produced — plus keep up with ongoing new vehicle air bags that they're already kind of at capacity producing, there ... isn't a solution," Brauer says. "There's no pressure relief valve that they can turn to easily to make the old air bag replacements, while continuing to make the new air bags for new cars." Four deaths have been linked to the defect. The problem seems to be triggered by humid conditions. The Department of Transportation has taken the unusual step of urging owners of millions of vehicles who live in areas with high humidity — such as Florida, other Gulf states and Hawaii — to act immediately. The warning cautions drivers not to use their vehicles until they are serviced by a dealer. Ellen Bloom, senior director of federal policy with Consumers Union, says she's worried that drivers have grown too apathetic about recalls. For instance, in the big General Motors recall that affects tens of millions of cars, only about half have been brought in to be fixed. "The idea that air bag can explode and send pieces of metal into your flesh is troubling to say the least," Bloom says. "Again, while no one should panic, we think it's a serious safety issue and that people should address it." Bloom says the government and carmakers need to do a much better job of informing the public about and resolving recall issues — and urges consumers to check on recalls at safercar.gov. David Whiston, an equity analyst with Morningstar, says car companies' stock prices or sales are unlikely to be affected, as most of the vehicles covered under the recall are older models. The background to this recall, Whiston says, is a movement to standardize parts across the globe. That's helpful for carmakers, "but, when something goes wrong, it will now go wrong across a much wider number of vehicles than people are used to hearing about in the news for a recall," he says. The main pressure in today's auto industry is to realize economies of scale, he says. "It's a viciously competitive industry; there really aren't a lot of weak players anymore. So, because of that, I think ... it's worth the automakers taking the risk of having more recall volume in exchange for getting more economies of scale," he says. Whiston expects high-volume car recalls to continue — but you really need to pay attention to this one. We've said it before and indeed 2014 is turning out to be the year of the recall in the car industry. At the center of most the recent round is little-known but extremely important auto parts maker Takata. Nearly 8 million vehicles have been recalled because of defective airbags so that they can be fixed. And now Congress is opening an investigation. NPR's Sonari Glinton has this look at the Takata Corporation and what this latest recall means for the auto business. SONARI GLINTON, BYLINE: This is a very different recall. For one, usually recalls affect one carmaker at a time. But this one is affecting not just one or two, but 10. Karl Brauer is an analyst with Kelley Blue Book. KARL BRAUER: The other big differentiator here is that there's essentially nothing you can do to kind of mitigate the potential damage or danger from these airbags if they fail. GLINTON: There's no big habit you can change or quick-fix you can make. Brauer says besides the numbers, the other thing that makes this different, well, the basic facts of what happens when the airbags fail. The airbags, which are supposed to cushion you during an accident, send metal shrapnel flying. BRAUER: So if you're in an unavoidable or unpredictable accident and in the blink of an eye an airbag fires, and in that firing it throws shrapnel at you at a high rate of speed, there's really nothing you can do about it. One minute you're driving, the next minute there's an accident - bang, boom, an airbag pops, and there's shrapnel thrown. GLINTON: Takata is a Japanese auto supplier that serves the global auto industry. It's responsible for more than 30 percent of the airbags in all cars. It's one of only three big airbag suppliers. BRAUER: If one of those three suddenly needs to recall and replace a whole bunch, like tens of millions of airbags that they've already produced, plus keep up with ongoing new vehicle airbags that they are already kind of at capacity producing, there kind of isn't a solution. There's no pressure relief valve they can turn to easily to make the old airbag replacements while continuing to make the new airbags for new cars. GLINTON: Four deaths have been linked to the defect. And the Department of Transportation took the unusual step this week of urging owners of millions of vehicles in areas with high humidity to act immediately. The problem seems to be triggered by humid conditions. The warning cautions drivers not to use their vehicles until they are serviced by a dealer. Ellen Bloom is with Consumers Union. She says she's worried that drivers have grown way too apathetic about recalls. For instance, the big General Motors recall that affects tens of millions of cars, only about half the cars have been brought in to be fixed. ELLEN BLOOM: The idea that airbag can explode and send pieces of metal into your flesh is troubling to say the least. So again, while no one should panic, we think it's a serious safety issue and that people should address it. GLINTON: Bloom says the government and carmakers need to do a much better job of informing the public about and resolving recall issues. She says you can check on recalls at safercars.gov. David Whiston is an equity analyst with Morningstar. He says car companies are unlikely to be affected in terms of stock or sales price. Most of the vehicles covered under the recall are older models. Whiston says the background of this recall is a movement to standardize parts across the globe. DAVID WHISTON: The more they can standardize the better off they're going to be. But when something goes wrong, it will now go wrong across a much wider number of vehicles than what people are used to hearing about in the news for a recall. GLINTON: Whiston says the main pressure these days in the auto industry is to realize economies of scale. WHISTON: And it's a viciously competitive industry. There really aren't a lot of weak players anymore. So because of that, I think the risks of higher recall volume - it's worth - I think it's worth the auto makers taking risk of having more recall volume in exchange for getting more economies of scale. GLINTON: Whiston expects high volume recalls to continue. But this one you really need to pay attention to. Sonari Glinton, NPR News. Transcript provided by NPR, Copyright NPR.